No doubt, the post-holiday hoopla has left you with a bunch of new electronics--and confusion over how to make them all work together. Imagine, for a moment, walking in the door at the end of a long day and with the touch of a button being able to disarm the security system, turn on the lights in various rooms, and have your favorite music begin playing throughout the house. Then as you enter your family room for some relaxation, one wireless keypad allows you to adjust the music setting in that room, turn on the television, and begin showing a favorite sitcom that was recorded the evening before. Without a home control system, this capability would require myriad remotes involving several switches and at least a half-dozen button pushes. The power of a home control system is in simplifying tasks. How do you accomplish this? Focus on unification, automation, and remote access. 1. Unification. Many homeowners buy electronics from different manufacturers. There may be a Panasonic television in the bedroom and a Sony plasma in the family room. In addition, televisions, DVD players, CD players, and digital recorders each have a unique interface and a different remote. 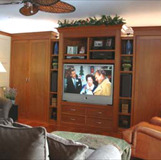 Home control systems simplify life by bringing all types of electronics together into one unified interface. 2. Automation. Another facet of this simplification is automation. Control systems allow homeowners to automate routine tasks. For example, as the sun begins to set, a sensor can automatically notify a control system to bring down the blinds, turn on exterior lights, and adjust the brightness of indoor lights. Or perhaps on Friday night, the system can automatically turn on the heat and the jets in a hot tub to prepare for a relaxing evening. 3. Remote Access. If you find yourself away from home a great deal, either because of travel or simply a busy family schedule, home control systems allow you to monitor and manage your house through the Internet. So if the temperature and lights in your house are set to adjust a half hour before you normally arrive and you plan to come home a bit later, you can access your system through the web and adjust any of the settings. Make sure your home possesses the right level of intelligence and convenience to truly support your needs. We don’t always have a chance to spend as much time at home as we would like, so the time we are there we should enjoy fully. Automating some of the routine activities of your life and simplifying the technology meant to make your life easier will certainly give you many more hours of enjoyment in your home.